Looking for a reliable and powerful disk catalog software to organize your huge collection of disks? WinCatalog 2018 disk cataloger is a perfect solution! On the market since 2001. Automatically create a catalog of all files, stored on your disks (HDDs, DVDs, CDs, network drives and other media storage devices): WinCatalog will automatically grab ID3 tags for music files, Exif tags and thumbnails for photos, thumbnails and basic information for video files, e-books, contents of archive files, thumbnails for images (pictures) and PDF files, ISO files, and much more. Organize your file catalog, using virtual folders, tags (categories) and user defined fields, and find files in seconds, using powerful search, even when disks are not connected to the computer. Also easily use WinCatalog as a duplicate file finder. Your disk catalog can be automatically updated through Windows task scheduler. 1. Scan and index your disks with WinCatalog just once, and WinCatalog will automatically create a catalog of your disks, files, and folders. 2. 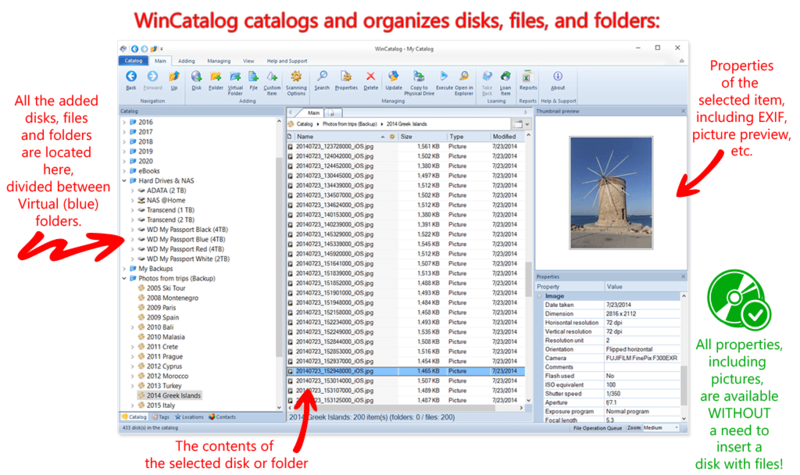 Organize your catalog of disks, files, and folders, using tags (categories), virtual folders and any user defined fields. 3. Use powerful search to find exactly what you need. Thanks to WinCatalog 2018 disk catalog software you can automatically create and store thumbnails of graphic files (images, photos) saved in all popular formats (JPEG, PNG, BMP, ICO, GIF, Tiff, WMF, and EMF) or RAW image formats produced by most of modern digital photo cameras. You can also save EXIF data (comments, resolution, [photo camera model, focal distance, and other parameters) for photos. This means you can preview picture thumbnails in the catalog without the need to open the particular media. And it will allow you to quickly and easily locate a photo or an image in your image and photo catalog! The program supports Zip, Zipx, RAR/RAR5, and 7z compressed files as well as ISO and NRG disk images. Files inside archives are displayed as files in folders. WinCatalog 2018 can display ID3 tags including artist name, song, album, disk cover and other information for music files in the following formats: MP3, WAV, WMA, OGG, OGA, ASF, M4A, M4B, M4P and MP4. For video files WinCatalog extracts and adds to video catalog basic information including thumbnail, codec, video frame resolution, audio tracks information, etc. So you can successfully use WinCatalog as a video catalog software. For E-books WinCatalog extracts a title, a description, author's names, and a cover image. The supported formats of e-books are Epub, Mobi, and FB2. WinCatalog implements both the typical search algorithm using simple queries and the advanced search using logical operators AND, OR, parenthesis and quotes - it makes the search more precise and provides exactly matching catalog search results. And since you can filter search results any way you want, you can find the desired catalog element almost instantly. Besides, search results can be grouped together using one or more criteria to find duplicate files quickly. The main advantage of WinCatalog 2018 is extremely high operating speed while processing disk catalog, thanks to industrial database standards and SQLite DBMS. Using this advantage, you can find any object (a disk, a folder or a file) in your catalog in a matter of seconds! We put much into developing as simple and straightforward interface as possible in order to let you enjoy all functions of WinCatalog 2018 disk catalog software right after installation. Contact management allows you to control who you give a certain disk to. Tag management allows you to assign a set of keywords (tags) to every element for quicker and more accurate search. While arranging the collection across virtual folders using drag'n'drop leaving the actual file and folder structure intact allows you to manage your disk catalog better. Storage management allows you to add all possible disk storage places to the program. This could be, for instance, "box #1", "DVD holder #2", shelf for hard disk drives #1, etc., and to assign matching collection elements with every storage place. This is an enormous time saver when you have hundreds of disks and other media. This function allows you to create nice reports, containing your file and disk catalog, to send to your friends, publish online, print or perform in-depth processing in MS Excel. WinCatalog disk catalog software correctly deals with any names and titles regardless of the language thanks to full Unicode support. "By the way — fantastic program. I had used WinCatalog Light years ago. Now bought copies of Pro for myself and my wife for work and pleasure. Having cataloged old drives I have been able to easily find things I had long forgotten."